The "Free Plus Shipping" offer means that the item is sold for $0.00 and a customer only needs to pay a shipping fee. It is a great way to sell cheap but high-quality items at the affordable price. If you want to sell products with a regular price and offer free shipping, and if you want to have several free items but customers need to pay the shipping cost, follow the steps below. 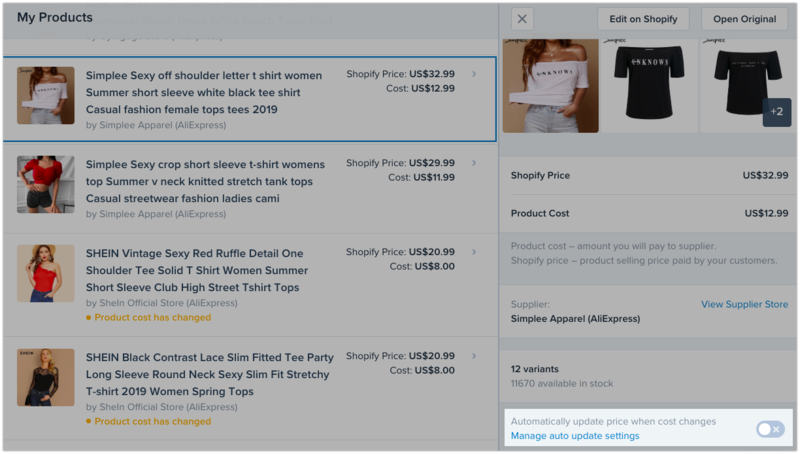 Go to Shopify admin > Settings > Shipping > Zones and Rates section. Here you can set up the countries you would like to sell your products to, and also determine the corresponding shipping rates based on weight. If you follow the settings in the example above, all of your items can be sold worldwide. If customers buy items with a regular price, the shipping will be free. However, if the customers buy items that are free, the shipping will cost from $7.00 to $35.00, depending on the quantity they order. Next, you will need to set the weight to 0.00 kg for every item with a regular price. Then, set the price to 0.00 and weight to 1.00 kg for every item you want to have listed as "Free Plus Shipping". Finally, to make sure that your product prices ($0.00) will always stay the same, you need to prevent them from auto-updating in Oberlo. To do so, navigate to your Oberlo account > My products page. Select the corresponding product and disable the ''Automatically update price when cost changes'' setting. Please note that this feature will be disabled if your "When the cost changes" setting is set to "Do Nothing". This way, the auto-update function will not reset the product pricing based on your preset global pricing rules. Instead, the product will stay at your custom price. After all of these settings have been completed, we recommend adding several products to a shopping cart to test if everything is working correctly. Note: Products, that are listed at $0.00 are not eligible to be uploaded to the Facebook Shop - there is a minimum requirement of $0.01 price tag. Therefore, if you use the Facebook sales channel, free products will not be visible in the Shop for your Facebook page visitors.